These days most of the people are having many phone numbers such as Mobile number, Home number and Work number. It is bit difficult to manage calls from all these numbers. For example if you are at your Office and someone is calling to your Home number you will be missing to attend that call. Google is releasing a Phone Management System to resolve these types of problems easily. This Phone Management System is named as Google Voice. It was developed by improving GrandCentral. It uses voice over internet protocol (VoIP) to link many phones together. So, now using Google Voice you can just use One Single number for all of your phones. Whenever a person calls your single number, your mobile or home phone or work phone will ring based on your setting in the Google Voice. Google Voice works with mobile phones, desk phones, work phones, and VoIP lines. There's nothing to download, upload, or install. Google Voice uses information from your address book to tell you who's calling. If the caller isn't in your contacts list, Google Voice can ask for their name and play it back for you when you pick up. Apart from this single number service Google Voice is having many features such as converting voice mail into text and conference call. Find below the complete list of Google Voice features. A single Google number for all user's phones. Free calls and SMS in the contiguous US. Call screening. Announce callers based on their number or by an automated identification request for blocked numbers. Listen in on someone recording a voicemail before taking a call. Send, receive, and store SMS online. Answer an incoming call on any of your phones. Phone routing. Particular phones can ring based on who calls. Voicemail transcripts. Read voicemails online. Listen to voicemail online or from a phone. Receive notifications of voicemails via email or SMS. Personalized greeting that vary greetings by caller. The ability to forward or download voicemails. Record calls and store them online. View the web inbox from a mobile device/phone. Set preferences for contacts by group. Google Voice is free and also currently it is ad-free. But at this time Google Voice is available in U.S only. I am just thinking whether Google will provide it to all Countries step by step, or any technical/political difficulties are there to prevent implementing it in all countries. And also it is now provided to limited people only based on invitation. You can apply here for getting invitation. Some people are questioning privacy and reliability of this phone management system. Read below links to know about what other people/blogs are telling about Google Voice. Håkan Djuphammar Vice president of Ericsson, predicted at a forum in Stockholm that cell phones will be equipped with NFC(Near Field Communication) technology within a year for using CellPhone as Credit Card. Already existing Contact-less Credit cards are working based on radio frequency identification (RFID) which is basically one-way communication system. This RFID was initially devised during Second World War for distinguishing friendly air crafts from enemy aircrafts. Now, RFID tags are used in many fields such as retail stores, shipment tracking, identifying people and animals. NFC(Near Field Communication) is the improved version of RFID. It will be two way and bio-directional communication system. So it will help to improve the security when using cellphone as Credit Card. Mobile user location data and IP mapping can be used to make sure whether the cellphone (I-e credit card) is used genuinely. These NFC mobiles can be used as Door Keys and Theater Tickets also. It seems already some banks in New York are implementing this NFC system in trial basis. Would you like to know what the next time is the Internationale Space Station (ISS) will fly over in your location? It will sent you personalized alerts as tweet to you based on your location specified in your Twitter profile either as text or as coordinates. This online Service is built by Dutch science reporter Govert Schilling and journalist Jaap Meijers. 1. Twisst collects location details of Twitter users following @twisst. 2.It uses Google Map and Yahoo to get geographic coordinates for the location of Twitter users..
3.Twisst uses www.heavens-above.com to see when ISS will fly over at those coordinates. 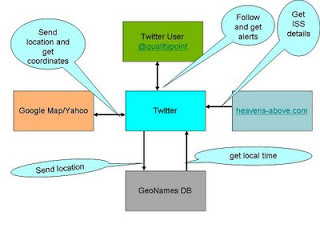 4.geographic database Geonames will be referred to get the local time of Twitter followers. 5.So, every time the International Space Station is coming, Twisst will send alert to Twitter followers in their local time. The International Space Station serves primarily as a research laboratory . 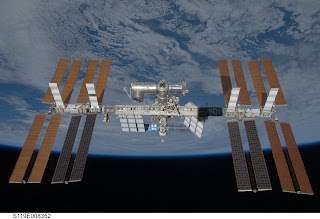 As of Today, ISS is the largest artificial satellite in Earth orbit. This project was jointly done by many organizations including NASA (USA), RKA (Russia), JAXA(Japan). The space station can be seen from Earth with the naked eye. You can see the recent scenes from ISS here. Google has announced an Analytic Dashboard for providing detailed metrics on traffic to local listings on Google Maps. Google says it is providing this kind of data to the Business Owners first time. what zip codes customers come from when they search for directions to your location. You can refer this blog for more details. If you search "bank" in Google you will be getting below search results. Here, you can see the local business results for bank which will show the address/phone of all the banks available in your area. And also it will show the map for the bank address. The business owners have to submit their address and any other details to Google Local Business center for including their business address in Google search result. To avoid unauthorized listing, Google will activate the listing only after doing verification either thro' phone or thro' postal mail. Google will be sending PIN number thro' postal mail to verify the address if we select Postal mail option. I am curious to know how Google is verifying the address thro' phone. Because someone can apply for others address (may be competitor's address) with wrong data and he can specify his phone number to get the PIN. So ultimately he will be able to list others address with wrong data. I don't know how Google is managing this issue. If anyone knows details you can share it here. It seems Google is concentrating more on Mobile Applications for iPhones and Android-powered devices. Recently, it has launched Gmail for mobile which improves Cache implementation in iPhone and Android-powered devices so as to make it tolerant of flaky wireless connections. And also Google has released Beta version of AdSense for Mobile Applications for enabling the Developers to show the Targeted Ads in Mobile applications also. For example, AdSense will show advertisements on Music app. based on user’s song list. Mobile applications are becoming more popular and they help people to get music, make hotel reservations or check bank balances on their phone. I am just thinking how Google is going to control/track/manage Genuine use of ads in applications. If it is successful, I think they can implement it in Desktop based applications also in future. But I am not sure whether it is feasible or not. Anyway, I hope adSense will encourage developers to create new applications and therefore people will get more free mobile applications. Normally we specify colspan attribute for <td> tag. We should specify the "S" in Upper case in the colspan, otherwise it won't work. It is easy to find last row from table. The below query can be used to get last row from table. $sql="select * from <table name> order by <field name> desc limit 1"
It displays one last row from table. HTML forms are used in webpages for collecting data from users. The Form will be submitted on clicking "submit" button in the Form. The form data will be inserted into database table only when the form got submitted, otherwise the entered data will not reach the database. Assume that an User fills a user registration form in a website and forgot to click Submit button and then navigates to some other page in the website. In this case all the details entered by the user will be lost. He needs to enter it again to submit the form for storing the details in the database. So, to avoid this issue we need to write a code which will give warning to the user when he leaves from the form without submitting it. We need to follow below steps to do it. -on loading a page we need to initialize a Boolean flag to indicate that no data available for saving it. -Change the Boolean flag when typing any data in the form to indicate that we need to save the data before leaving from the page. -call a function when clicking any link in the page to give warning/alert message based on the Boolean flag value. function check_buttonpressed_ischanged()//this function invoked when submit button  get clicked. Find below the Reddit users comments for this post. call a function when clicking any link in the page to give warning/alert message based on the Boolean flag value. Or, we can just set up an unload event handler. * Wouldn't unload still be called when the page is unloaded while submitting the form? * On an AJAX-based site, it is possible to click a link on the page that will replace the form (and the rest of the page) with other content, all without unload() ever being hit. That's why you add an onSubmit event on the form to disregard the unload event. White spaces entered in Textarea of HTML page will be considered as Characters even when no other characters are entered. These white spaces will then be inserted into database table unnecessarily. It will clear the whitespaces in the Textarea. We faced some inconsistent issue with MySql query. When we tried to use below mysql query we got error. So, we tried below query. But this way also didn't work. So, we made change like in following statement, it works good without any issue. eval() which evaluates a string and executes it as if it was script code. Let us see the need for having this eval function. category_name1,category_name2,category_name3.....which are dynamic in a page. Trying above way, does not work. Trying following way, will work well. We can refer this article to know more about eval. Below PHP code will be used for listing files in a folder. Auction is the process of buying and selling Goods or Service based on bids. Generally in auction, the seller puts an item (e.g Digital Camera) up for sale. Multiple buyers bid for the item, and one or more of the highest bidders will be selected to buy the goods at a price determined at the conclusion of the bidding. There are many online auction sites e.g eBay.com are available in internet. In these Auctions Buyers compete to get a Good or Service. So it will give benefit to the Seller. But, in another form of Auction which is called as Reverse Auction , sellers compete to obtain business (Goods or Service). It will give benefit to the Buyer. i-e In Reverse Auction the role of Buyer and Seller are reversed. It drives to reduce the purchase price. In physical world, it is bit difficult to conduct Reverse Auction. Assume that you are going to purchase Digital Camera. And assume that in you place there are 10 shops available to sell different Digital Cameras. You can not expect all the 10 shop keepers to meet you and give their price list for enabling you to get the least price. Instead, you need to go to all 10 shops and get quotation from all of them and then you need to select least price within the 10 prices. So, Reverse Auction in physical world is normally not much used. But in online world it can be easily implemented. So, there are lot of Reverse Auction sites available in Internet. For example all freelance websites are working based on Reverse Auction only. Here the Buyers will be giving the requirements as Bid Request. Many Sellers (i-e Coders) will be placing bid amount. Finally the Buyer can choose the Seller who placed least bid amount. Here the freelance website will be called as market maker. Now we can think about how this Reverse auction can be implemented in Goods purchasing sites (i-e shopping Carts). The Market Maker website will show the Goods from many vendors/Suppliers in their websites. The customer will be allowed to choose the items from different suppliers so that he can get least price for all the items. As far this point, this Reverse Auction on online is simple. Now think about delivery charge. Each supplier will be collecting delivery charge from the customer(buyer) irrespective of how many items the buyer selects from their cart. So, the buyer can not select the least priced item from each supplier blindly to get the best price. To explain it more clearly, consider below example. The buyer wants to buy 2 items, and 2 Suppliers are supplying those items with below prices. Just by seeing the above price list you will be thinking that getting Item1 from Supplier1 and Item2 from supplier2 will give least price (20INR). But we should consider Delivery price also. Assume below delivery price for the Suppliers. If we include the Delivery charge then the total price will become 34 INR(20+6+8). So it is better the get both items from Supplier1 itself. In this case the item price will be 21 INR, and delivery price will be 6 INR. The total price 27INR (21+6) will be less than 34 INR. So we need to have specific steps/algorithm to find best price when developing Reverse Auction website. The algorithm will be again complicated as few Items won't be available with some Buyers. We need to consider this constraint also when developing Reverse Auction website. For one of our clients we have implemented this best price finding system. We followed below steps for implementing it. - Find permutations of all options and insert them into temp table with optionid. - Delete invalid options from temp table. - include delivery charge for each option in temp table. - calculate total charge for each option and then select minimum from them. - We can find suppliers and delivery charge for the selected option. The core concept is simple. Just we need to consider all possible combinations and need to find total for each of them. And finally we need to choose a combination which is having least total value. But we had to spent more time and effort to implement the first step i-e finding permutations of all options. Because, we are having math formula only for finding permutations to select 'r' items from 'n' only when the value of 'r' is less than the value of 'n'. I-e there won't be any duplicates. So there won't be any standard math formula/algorithm to get the result. After doing a lot of search in the internet, finally I got a sample code written in C language for finding permutation even when duplicates available. I then converted the C code into C# code and successfully implemented it in our Project. As we used mdb table for doing this process, the I/O process significantly reduced the performance. So again we implemented it using C# Datatable itself. We got email from an QA Expert for improving our Quiz. In his mail, he pointed out some small issues in Testing part of our Quiz and given comments and suggestions to improve it. Please find below mail from the QA expert Martyn Walmsley. I am a Test and QA manager for a UK bank with over 25 years in IT and over 16 years in test and QA, 8 of these in test and QA management. I obtained the ISEB Test Practitioner qualification in 2004. I've taken your online test, which I found interesting. With my experience, I took all 21 hard questions. Some of them I would regard as basic for someone who has been in the test industry for more than 6 months but I appreciate that an online quiz can only go so deep into the subject. I thought I'd offer my observations on some of the questions as there are some elements I disagree with and some questions which I think could be better expressed. There appear to be some typographical errors also which I will raise questions against. I offer these comments as improvement suggestions and in a spirit of encouragement so that you can better deliver against your vision statement. Retesting of a single program or component after a change has been made? I consider the wording of this question to be ambiguous. The question does not specify whether the elements being tested are those which have been changed OR the functionality which has not been changed. If the test is of the functionality which has not been changed, then the answer would be "unit regression". If the test is of the modified functionality, the correct answer would be worded as "unit functional test" so the available answers do not cover the answer set needed by the question. Do you mean "Black Box testing" as "Block Box Testing" is not a term I have come across before? It is not a test type identified in the ISEB syllabus at foundation or practitioner level. 8. What is correct Software Process Cycle? These are the primary purposes of "Acceptance testing". Defects may still be detected but by this phase they should be few in number and minor in impact, being not threatening to the release of the software. Those delivering the software into "Acceptance testing" should normally be expected to have tested the software against the requirements statement. They should have validated that they can detect no deficiencies against the stated requirements and their expectation should be that no defects would be uncovered during acceptance testing. For these reasons I suggest that "Acceptance testing" is a "Beta Testing alone" activity. 20. Boundary value analysis belongs to which testing method? Boundary Value Analysis is recognised primarily a Black Box testing technique. The technique can, however, be applied equally to white box testing when analysing paths through decisions, whether they are of the If ... Then or Select Case type decision or whether they are iteration control statements, i.e. loop counters in For ... Next , While ... Wend constructs or Do ... loop Until Constructs. When questioning a job applicant about the application of test techniques, I would expect them to reply in this sort of manner. Thanks Martyn for your valuable comments. We have corrected the issues and analyzing your comments to make any further corrections. We are expecting more comments/suggestions from users/visitors to improve our blog and quiz so that it will be more useful for all. Google Labs is experimenting new search feature. It is called as Squared. It will collect the details for the search keyword from many websites and combine them display search results in structured format such as Excel like structure having many rows and many columns. You can see/test it at http://www.google.com/squared. Find below the screenshot which show search result for india primeminister. We can see Name, photo, description, date of birth and some other details of each us president in tabular format. It will be more useful for doing comparison in Research. Interestingly, when I did a search for "search engine" the result page didn't show the Google. So I thing it is still in very initial stage of testing. There are lot of social networking sites available in the internet. Digg, reddit, orkut, linkedin, myspace and facebook are some of the leading sites. Twitter is now getting more popular among all of the social networking sites. We can say that Twitter is the latest social-networking craze. Basically we need to send small text messages (Maximum 140 characters) as answer for the above question. So, it can be considered as Micro-blogging service. As it is using small text messages it is used widely in mobile devices also. We need to create a twitter account to start using the Twitter. This below steps involve in using Twitter. - Create your Twitter account. - After seeing the profile(eg. qualitypoint) , if you are interested to know the updates from them (i-e from qualitypoint), you can Follow them. - Once after following qualitypoint you can see the updates from qualitypoint unless until qualitypoint blocks you. There is no need to wait for getting approval from qualitypoint to get updates from qualitypoint. - Similarly you can follow any number of people from whom you want to get updates of what they are doing. -And also, other people can also follow you. They will be called as your followers. They can read you updates. The updates/message sent thro' the twitter is called as tweet. So, basically all Followers of any person can read the tweet of that person. And, also we can use feature such as @reply for sending a message (i-e tweet) to a person even when he is not your Follower. If you want to send tweet to only a particular person and you don't want the other followers to see it, then you can use Direct Message feature. We can see the current tweets about any keyword by searching it at search.twitter.com. If you want to specify any keyword in your tweet you can use hash tagging. i-e just add hash symbol (#) in front of the keyword. The real power of the twitter lies in Re-Tweeting. Your follower can re-tweet yout tweet by specifying RT to his followers. By doing this, you will be getting opportunity to get more followers from the followers of the person who is re-tweeting your Tweet. Since millions of users using Twitter, it is used for doing marketing and getting more support also. Especially it is used as Viral Marketing. There are lot of Twitter applications/Tools are available for using with Twitter. We are using Twitlet which is a bookmarklet used for handle tiny url effectivly. Some feed applications are available to automatically post your blog posting to twitter. This feed service is effectively used by marketing persons. Similarly your latest Tweets can be displayed in your blogs. And, you can put Twitter badges on your blog to encourage your blog visitors to follow you on Twitter. Some applications such as Twitter Alerts will sent you email based on your keyword setup to give details of tweets that are having your keyword in it. TweetLater will help you to schedule your tweets so that you followers will get updates from you even when you are busy with some other work. You can watch below youTube video to know the basics of Twitter. One interesting thing is, as of now Twitter website is not having auto refresh functionality. We need to manually click the refresh button in the Browser to get the latest updates/tweets. I think Twitter is not providing this option to keep the high performance of the Twitter. Anyway, many Twitter applications are available to solve this issue. Contact Us if you want to develop your own Custom Twitter applications. I have explained about inconsistent behavior of createElement function in IE and mentioned workaround also in my previous post. Today, we faced similar issue with createElement. This issue is also again related to IE. Find below the sample code which will create a new button. A function "showmsg" should be called on clicking the new button. The above code worked fine in FireFox. But it didn't work in IE. Once after searching the internet we found below workaround for resolving this issue. Instead of using setAttribute for onclick event, we used below code. Once after making the above change the code is working fine in both IE and FireFox. Use Gravatar to display your icon image when adding comment in any gravatar supported blog. Gravatar(globally recognized avatar) is a service providing globally-unique avatars. i-e It will show avatar( small icon like profile image) which will be displayed near the profile/user name in a blog/forum based on the email id used for creating the profile. Once you create your Gravatar at http://en.gravatar.com/ for your email id, the gravatar will be automatically displayed in any gravatar supported blog/forum near your user name whenever you are adding any comment to the blog. Content Management System (CMS) such as Drupal is providing support for Gravatar. You can refer below url for implementing Gravator support in your website. tinyurl.com is providing service for shortening any long url. The short url will be useful to remember it and also it will be useful when we are having limited space for specifying the url. For example, twitter will allow only 140 characters. To save space Twitter is using tinyurl service. Even we can manfully create the tiny url to use it in twitter to effectively handle the 140 characters limit. ie First shortern the long url using tinyurl.com and then enter this tinyurl with your message in twitter. We need to use tinyurl only when it is really necessary or useful. Because, it is having its own drawbacks. The reliability of tinyurl is still in question. Because, if the tinyurl site goes down for few minutes we can not access the url for those few minutes even when the actual website is not down. tinryurl is functioning based on 301 redirect which will not affect the search engine ranking of the site. Anyway, I am not sure whether the search engines will consider the tinyurls exactly same as true urls. Some bookmarklets such as twitlet/ are available to make this easy. i-e just we can enter the message and url in a pop-up window of bookmarklet and then it will be automatically send to twitter after shortening the url. This main difference between the use of tinyurl in twitter and twitlet is, twitter will restrict the 140 character limit even before shortening the url. But twitlet will truncate the message based on 140 characters limit only after shortening the url. without affecting existing content of the webpage. i-e Some part of the existing webpage on a webbrowser can be refreshed with the content from web server without changing other parts of the webpage i-e without refreshing the whole webpage. Ajax was made popular by Google by using it in the Google Suggest. So, basically below steps are involved in using ajax for webdevelopment. - A place such as div in the client side code for placing the server response got from the ajax call. We will see the above steps in detail using below sample code. Consider below HTML code which will be placed within a Form. The selected value (i-e name in this example) will be passed as argument to the showUser. You can refer the GetXmlHttpObject() below. The url to be sent as server request is created by specifying the server-side webpage (e.g getuser.php), the function argument "name", and a random number to avoid cache problem. A function stateChanged is called on onreadystatechange event for getting the response from the webserver for the request of this created url. You can refer the sample stateChanged function below. This function will check the readystate status. If it is complete then webserver response text will be placed inside the client side form, otherwise it will show some loading indication. Find below the sample server side code (e.g getuser.php) which will be used for sending response according to the value selected in the drop-down list. The above code is receiving the selected drop-down value as "q" querystring parameter in the url. sql query will be used for fetching details such as firstname, lastname age for the corresponding "q" value. The xmlhttp object is receiving the output of this php page. Advantages of php over asp and converting asp site into php site. php is having many advantages over asp in terms of cost, Speed, Security and flexibility. Refer below articles comparing asp and php. So, it will be useful if we convert any existing asp websites into php site. Some converters are available to convert any asp website into php site. You can download asp2php converter here. I haven't tried it yet. Some online converters are also available to convert asp webpage into php pages. Find below an online converter. If you want to manually convert the asp pages into php pages, you can follow below steps. Conversion of asp to php. In asp no need to put semicolon at the end of the each line, but semicolon required in php. 4. XMLFileName = BaseXMLPath & "about/" & SectionID & ".xml"
In asp Server.MapPath() function returns the physical location of the file name of asp file. We can use below workaround to get file location. Anyway, if you know alternate simple solution you can share it here. 8. The asp Request.ServerVariables("URL") function return folder name and filename. 11. In asp Response.Write() function is used to display content in webpage and Response.End() is used to end the execution flow. Its equivalent function used in php is echo and die. 15. the Int() function in asp is replaced by intval() in php. 18.The Mid() function in asp returns a specified number of characters from a string, we used substr() function to return the same string in php. 19. the Replace() function in asp is replaced by str_replace() in php . 20. the Trim() function in asp is replaced by trim() in php. Mostly any web development will require to insert or update form data into a database. The number of fields and names of form fields will vary in each and every form in a website. And, sometimes we need to insert the data and sometimes we need to update the data based on whether the key field is already available or not. So, we had to write many different queries to insert/update data in many forms. Ultimately, it will take lot of time and effort. Below function written in php will help to save time, as we need not explicitly write the form names. Only thing is you have to give the form field names exactly same as database table field names. The below function will insert the named $fields of the given $post array into table $table_name if $id is null. It will update the existing row if $id is not null. The $id of the row is always returned. $sql = "UPDATE $table_name SET ". join( ", ", map( $fields, update_field, $post ) )." Note that below functions used in map() are built-in php function. func_num_args — Returns the number of arguments passed to the function. func_get_arg — Return an item from the argument list. Find below the sample usage of this function.